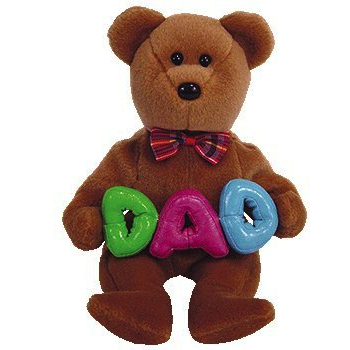 Dad is made from a brown material with black button eyes and a larger black button nose. He wears a red tartan bow tie and the letters “D A D” in his paws. The first “D” is green, followed by a purple “A” and a blue “D”. I hope you know that I love you! Dad was released on 10th May 2005. His birthday is on 19th June 2005. This version of Dad has a purple letter “A” and was exclusively available on the Ty online store. There is another retail version where the “A” is yellow. He retired on 23rd June 2005.